Psychologists regard the relationship between attitudes and behavior as a key to understanding human behavior. Here leading researchers discuss basic and applied issues relating to how human thought translates into action. The contributors focus on the theory of planned behavior, a model of attitude-behavior relations that takes into account not just attitudes, but also the influence of significant others around us, issues of personal agency, and motivation. 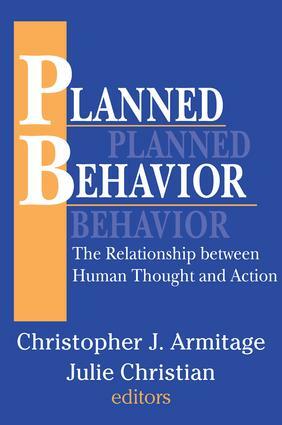 The book begins with an overview of the theory of planned behavior, from the initial impetus to better understand attitude-behavior relations, through the theory of reasoned action, to the theory of planned behavior. Among the applied issues discussed in subsequent chapters are using the model to predict homeless persons' use of services, understanding the motivation underpinning suicide in an at-risk sample, and experimentally manipulating antecedents of risky driving behavior. More methodologically oriented chapters explore how the theory of planned behavior may be developed in the future. Several chapters discuss the potential integration of the theory of planned behavior with social identity theory and goal theory; other chapters discuss the key components of the theory of planned behavior and whether the theory might usefully be extended with the concept of descriptive norms. This book considers a full spectrum of important developments that enhance our understanding of the theory of planned behavior and efforts to extend it. From applications to new avenues for research, the chapters that make up this book address important issues surrounding theoretical and practical approaches to addressing problems in attitude-behavior research.